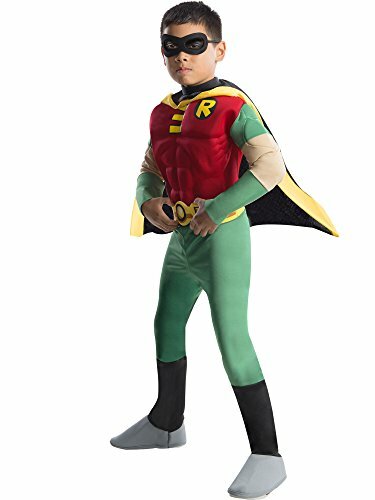 Have your child take the lead this Halloween with this Teen Titans Robin costume. Robin leads a group of 5 teenaged superheroes as they battle with criminals that try to take over their city. Your little one can live his dream of being a superhero every time he puts on this fun costume. Rubie's Costume Company has been bringing costumes and accessories to the world since 1950. As the world's leader we take seriously the mission to make dressing up fun. Mascots, rental quality costumes, masks, wigs, accessories, shoes, and every significant licensed costume you want to wear can be found under the Rubie's brand. Still family owned, still family focused; Rubie's brings you fun for every season, Halloween, Christmas, Mardi Gras, Easter, and all in-between. 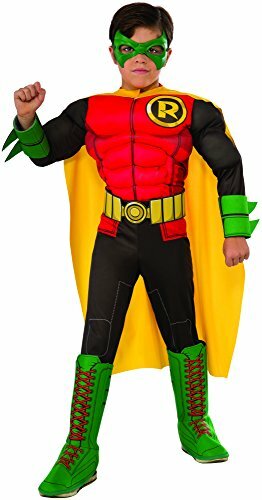 Officially licensed DC Superheroes Deluxe Robin Costume. 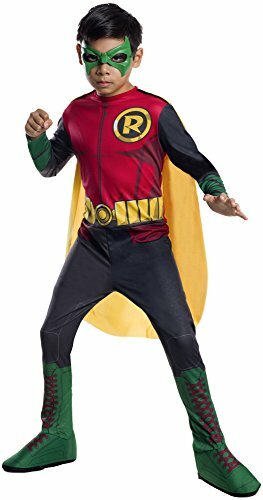 More than just a sidekick, Robin is a superhero in his own right, a Caped Crusader on a mission for good in this officially licensed deluxe costume. Rubie's Costume Company has been bringing costumes and accessories to the world since 1950. As the world's costume leader, we take seriously the mission to make dressing up fun. Mascots, rental quality costumes, masks, wigs, accessories, shoes, and every significant licensed costume you would ever want to wear can be found under the Rubie's brand. Still family owned and still family focused, Rubie's brings you fun for every season: Halloween, Christmas, Mardi Gras, Easter, and all in-between! 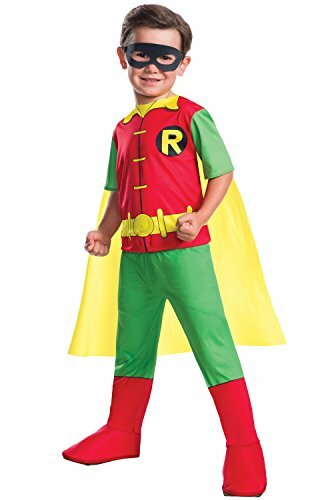 Officially licensed DC Superheroes Robin Costume. More than just a sidekick, Robin is a superhero in his own right, a Caped Crusader on a mission for good in this officially licensed costume. Rubie's Costume Company has been bringing costumes and accessories to the world since 1950. As the world's costume leader, we take seriously the mission to make dressing up fun. Mascots, rental quality costumes, masks, wigs, accessories, shoes, and every significant licensed costume you would ever want to wear can be found under the Rubie's brand. Still family owned and still family focused, Rubie's brings you fun for every season: Halloween, Christmas, Mardi Gras, Easter, and all in-between! 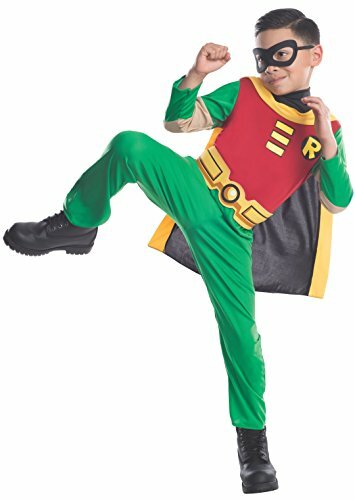 Officially licensed deluxe DC Comics Robin costume. NOTE: costume sizing is different from apparel, be sure to review the Rubie's Costume child's size chart before selecting best option for your child. Rubie's is in business and stocking product 12 months a year; a leading innovator in the industry, Rubie's has the broadest product line of any costume Company. Rubie's has more than 2 million square feet of office, development, warehouse, and production space. Products are manufactured all over the world, with approximately 35% of annual sales produced in Rubie's owned us factories. Same family ownership since the beginning in 1950. 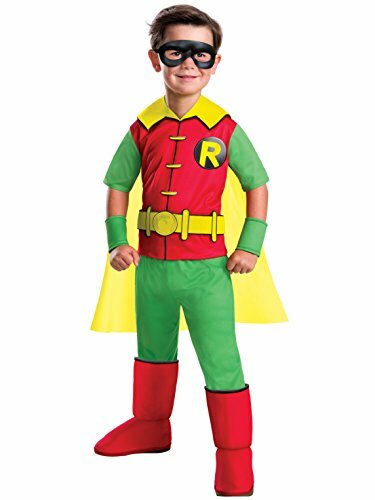 Officially licensed Young Justice Robin child costume includes jumpsuit with attached cape, belt, mask, and gloves. Rubie's Costume Company has been bringing costumes and accessories to the world since 1950. As the world's leader, we take seriously the mission to make dressing up fun. Mascots, rental quality costumes, masks, wigs, accessories, shoes, and every significant licensed costume you want to wear can be found under the Rubie's brand. Still family owned and still family focused, Rubie's brings you fun for every season: Halloween, Christmas, Mardi Gras, Easter, and all in-between. 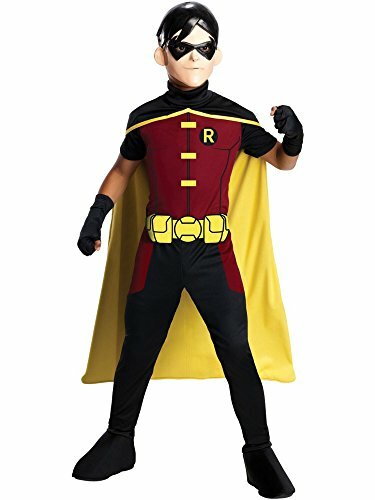 Have your child take the lead this Halloween with this Teen Titans Robin costume. Robin leads a group of 5 teenaged superheroes as they battle with criminals that try to take over their city. Your little one can live his dream of being a superhero every time he puts on this fun costume. Rubie's Costume Company has been bringing costumes and accessories to the world since 1950. As the world's leader we take seriously the mission to make dressing up fun. Mascots, rental quality costumes, masks, wigs, accessories, shoes and every significant licensed costume you want to wear can be found under the Rubie's brand. Still family owned, still family focused; Rubie's brings you fun for every season, Halloween, Christmas, Mardi Gras, Easter and all in-between. Officially licensed DC Comics Robin costume. NOTE: costume sizing is different from apparel, be sure to review the Rubie's Costume child's size chart before selecting best option for your child. Rubie's is in business and stocking product 12 months a year; a leading innovator in the industry, Rubie's has the broadest product line of any costume Company. Rubie's has more than 2 million square feet of office, development, warehouse, and production space. Products are manufactured all over the world, with approximately 35% of annual sales produced in Rubie's owned us factories. Same family ownership since the beginning in 1950. Cosplay #2 of 2018 is none other than The Boy Wonder himself ROBIN! This is part 1 in a series I'll be doing covering the making of this suit! Teen Titans Go Starfire and Robin Costumes and Makeup!